This is the second post about the bacon I produced from a full side (belly) pork slab I picked up on a trip to Montana. I have added some molasses to my curing of bacon in the past but I am doing it a little differently in this post. Instead of mixing molasses into the cure mix, I rubbed it on the surface of the pork before applying the cure mix. To make dry cured bacon you need to understand the process of curing. You make a mixture of salt, curing salt and a sweetener. The salt pulls the moisture out of the meat. The curing salt is a mixture of salt and sodium nitrite that gives the bacon its cured flavour and red colour. It also inhibits bacterial growth. Bacon is cooked at low temperatures and cured for a long period of time. Without the curing salts, the meat may spoil. The curing salt usually used is called Prague Powder #1, Instacure #1 or many other names. Whatever it is called, you are looking for a product that is 93.75% salt and 6.25% sodium nitrite. The sweetener adds a nice touch of sweet to offset the saltiness of the bacon. I started by cutting the side pork in to pieces for the three different kinds of bacon I was making. If it has the skin on, carefully slice it off with a sharp knife. For molasses bacon, I started by weighing the pork. For each pound of pork you are curing you need to use 3/4 teaspoon of molasses. In metric, for each kilogram of pork you need to use 10 ml of molasses. Rub the mixture all over the pork. Put the pork in a resealable plastic bag and scrape all the material that fell onto the plate into the bag. You now need to let the cure soak into the meat. How long it rests is determined by the thickness of the meat. I multiply the thickness of the meat in inches by 4 and add 2. My pork was 1 1/2 inches thick. So, it had to cure for 8 days (4*1 1/2+2). You shouldn’t dry cure any cut of meat over 3 inches thick as it takes too long to cure. I put the bacon in the fridge and let it rest in the bag for 8 days, turning it and rubbing the cure in every day or two. I took the bacon out and rinsed it well under running water. I put it in the fridge, uncovered overnight. It is important that the surface of the bacon is totally dry before smoking to get a good even smoke. If the surface is wet, bad smoke flavours can form on the surface. The bacon should be quite dry coming out of the fridge. If it isn’t, dry it with a paper towel and let it sit on the counter until dry. You can use a fan to speed this up. I like to double smoke my bacon. So, I fired up my A-Maze-N Pellet Smoker and put it in my smoker. I didn’t turn the smoker on, I just put the bacon in with the pellet smoker and let it smoke for 8 hours. You can skip this step if you like a lighter smoke on your bacon. After this cold smoke, I put the bacon in the fridge overnight. I preheated my smoker to 180 F and smoked the bacon to an internal temperature of 130 F.
If you don’t have a smoker, you can put the bacon on a rack over a tray in your oven at 180 F and cook to an internal temperature of 180 F. This will give you a non-smoked bacon similar to some made in Europe. I put the bacon in the fridge for a day then sliced it up and gave it a try. 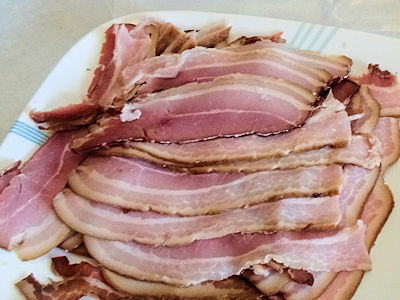 When you taste this bacon, you won’t immediately think molasses bacon. But it does have a deeper sweetness than regular bacon that really goes well with the smoke flavours. You can really notice it when you taste it side by side with regular bacon. I love it! Put the pork on a plate. Rub the molasses over all surfaces. Mix the Prague powder, brown sugar and salt together. Rub it over all surfaces of the meat. Put the meat in a resealable bag and scrape any material that fell onto the plate into the bag. Seal the bag and put it in the fridge for the number of days calculated by multiplying the thickness of the pork in inches by 4 and adding 2. Turn the bag every day or so. Rinse the bacon well under running water and dry it with paper towel. Put it in the fridge, uncovered overnight. Make sure the surface of the pork is dry. Cold smoke for 8 hours. Put it in the fridge overnight. Smoke at 180 F until the internal temperature of the pork is 130 F.
Store the bacon in the fridge, covered for one day. Slice and cook or store in the freezer. Oh wow!! This just looks amazing. I wish I had some of this to taste. I’ll send my address later!! I’ll bet the rest of class appreciated that you never blew it up the lab!! Ha Ha!! I don’t know how American customs would feel about home made bacon in the mail! Thanks, Sam. Oh my word I love this recipe…….thanks for sharing! Thanks, Josie. It is hard to beat home made bacon. Thanks! I will have to check that group on Facebook. Is there any harm adding more molasses if you like the sweet flavor? The great thing about cooking is making the way you like! Adding more molasses would be great. The only thing I will warn you about is that a lot of sweet in the bacon makes your pan mess up a bit when you cook it.